Room 7 decided to do some researching inside Glenbrae School and explore what our school has in store for us. Room 7 were determined to search through drains and see how much rubbish Glenbrae stores into the drains, which lead into Water Pollution. After a while peeking through the drains of Glenbrae, Room 7 noticed that there were a lot of packaged food items. 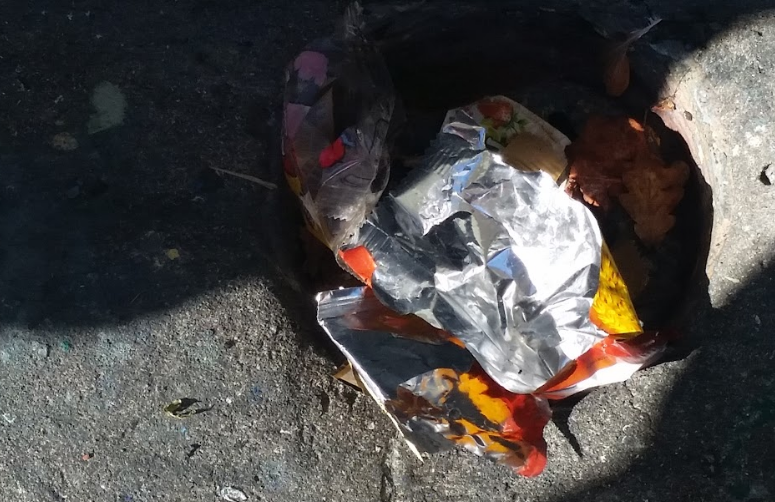 Multiple food packages were found not only in the drain, but all around the bright green grass. 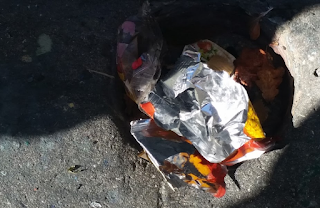 Mrs Tofa, took some pictures and about what type of rubbish is lurking inside our drains. Before Mrs Tofa decided for Room 7 to go outside searching for rubbish, she discussed creating a movie, slideshow or poster. Here is a few pictures on what type of rubbish Glenbrae had. My perspective is about Water Pollution. How would this earth be with all the pollution in our Streams & Rivers. Many people just don’t care about what they are doing with their rubbish, the rubbish may be including fast foods or even just rubbish from local supermarkets. The worst thing about rubbish and water pollution is that all the sea life is being affected with all the rubbish. For example, a turtle had a long straw in it’s nostrils, I was very terrified while hearing this. Now it would be time for myself to answer some question. ~ Water Pollution is chemical, physical or biological change in the quality of water, which give a critical effect. It will affect, whoever drinks from it and whatever lives inside it. Water Pollution is dangerous for all around the world, and needs to be stopped immediately. I have been learning to code, using Hour Of Code. The skills I have learnt include using the move forward, repeat block and the fish block in Moana. I have shared my Moana Presentation in my ePortfolio, to visually showcase my work. I have also shared my presentation in the Year 8 Class community as a reusable learning resource for others. 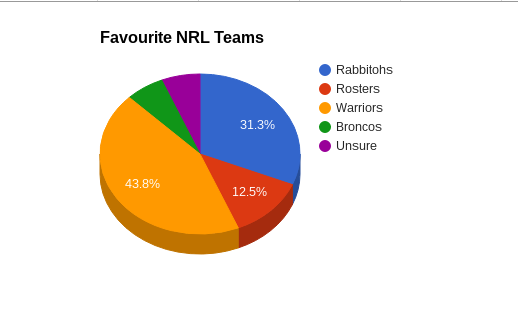 These graphs are about Room 7's favorite NRL Teams. 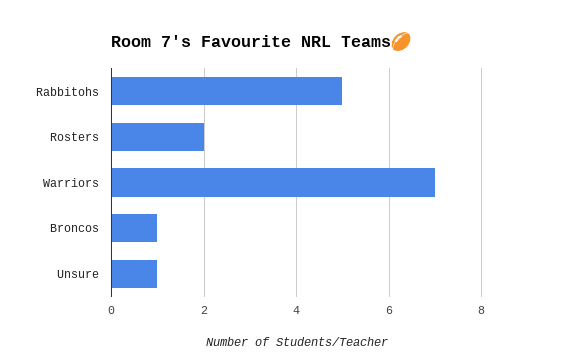 As you may see, Warriors are the most frequent team in Room 7. My name is Aaliyahna, I am apart of the Te Taiao o Tāmaki blogging. My blogging partners/participants are Ana from Tamaki Primary, Uinisieti from St Patricks and Moroni from Pt England. Today, it was a bright and hot sunny morning. Room 7 was sitting quietly, while the attendance was being called out by Mrs Tofa, the students were getting a bit laggy so Mrs Tofa, decided to have a little bit of fun. 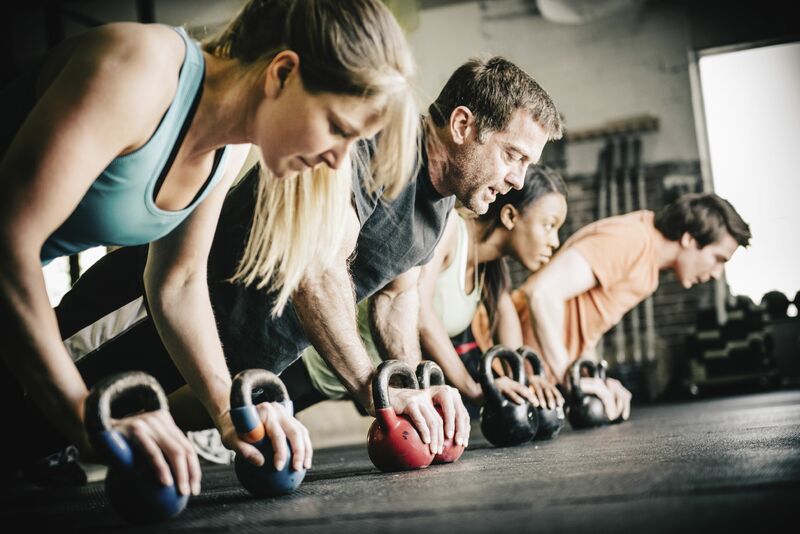 “Ok, everyone, line up outside for fitness” she says, so we all walked so excited and quietly. Firstly, it was time to stretch, the first ‘confident’ person to stand in the middle and pose a stretch was of course Luisa. It took room 7 at- least 10 minutes for stretches as many were too eager to play Volleyball. A long 10 minutes went by, and the Volleyball posts were still getting set up, so we all decided to play a game called “Octopus”. Octopus is where there are taggers and they will call an instruction, whatever they say, we do! Lastly, we, actually most of us thought we will be playing Volleyball, but soon after the stretches and Octopus, it was time for Reading! Ana Hamu, she was a Maori women chief & was the very second women chief to sign the Treaty Of Waitangi. Ana Hamu is from the Ngapuhi Tribe, but that is still unconfirmed. She signed the Treaty of Waitangi on the 6th February 1840. Here is just a little bit of information of her back story life. Out of the thirteen women who signed the treaty, she was the second women, but the 61st person. She was one of the widows of chief of Te Uri-o-Ngongo, Te Koki and patron of the Anglican Church Missionary Society’s mission station at Paihia. Ana Hamu had a very strong personality, she also stayed with the British missionaries. Hamu was baptised and was named Ana by Henry Williams. Patuone was a very close relative of hers, he was the eldest son of Tapua, leader and Tohunga of Ngati Hao of Hokianga. "Kia Ora,I, Ana Hamu, would like to carely sign the treaty of Waitangi after Takurua. Although my husband disagrees towards myself signing, I will be determined to sign the Treaty of Waitangi. My Husband assumes it would be discriminatory towards women, as only myself and 12 other Maori Women chiefs have signed. Despite the fact that only a few women chiefs have signed the treaty because of unfairness, I think the Treaty of Waitangi would be exceptional. My ambition would be for most, chiefs & British to sign the treaty for extra responsibility and less problems - that would help my tribe, Ngapuhi and my leadership roles, involved with being the widows of chief of Te Uri-o-Ngongo. Many Chiefs may doubt my ambition, but, i’m sure everyone has their own opinion." Kia Ora, ahau, Ana Hamu, e rite ki carely haina te tiriti o Waitangi i muri Takurua. Ahakoa te kore taku tane ki te haina i ahau, ka waiho ahau fakapapau'i ki te haina i te Tiriti o Waitangi. riro toku Husepānití e te mea whakahāwea ki nga wahine, pera me kua hainatia rangatira ahau anake me 12 atu Māori Women. Ahakoa te meka e kua hainatia rangatira i te torutoru noa nga wahine te Tiriti mo te faaupooti'aee, whakaaro ahau te Tiriti o Waitangi e makehe. e waiho taku tohe mo ki te nuinga, rangatira & Ingarangi haina te tiriti mō fatongia anō me te iti iho raruraru - e e tauturu i toku iwi, Ngapuhi me aku tūranga ārahi, whai wāhi ki te nga pouaru o tino o Te Uri-o-Ngongo. kia ruarua maha Rangatira taku tohe, engari, ua papû katoa he ratou ake whakaaro i. During my time in Technology, I learnt about ePortfolios and we will be trialling the use of ePortfolios. The ePortfolios will be used to visually showcase the work that we would be doing in Technology. We will use our ePortfolios in each technology subject. We will use our blogs to reflect on our learning. 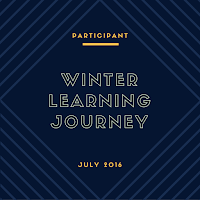 We will also use the Year 8 DigiTech Blog to collaborate on different learning activities. These are the different ways, in which we will share, what we learn. This piece of work was all collaborative. We each had a section of work to do and proceeded with these perspectives. Hone - Heke longed for some law in NZ, due to some Europeans settlers in Kororareka whose behaviour was out of control. Which is why he ordered the Europeans to stay. William Hubson wanted the treaty to be signed, but had no strength due to the conditions of being tispy. The Maori people considered him as an close European representative. James Busby - James Busby seemed so interested in the Treaty, since Queen Victoria ordered him to controlled everything with the signing. But truth be told, he didn't care at all, all he wanted was to get on with it. Nothing Else! Why a treaty was needed? Maori- They desperately needed the treaty due to the behavior of European settlers in Kororareka/ Russell. Also because the Europeans offered better and more advanced weapons which the Maori people wanted their hands on. They also signed the treaty because they wanted regulated settlement and support in controlling settlers and land sales. Why some didn’t sign the treaty. The treaty was not passed on to some areas in NZ, like Hawkes bay. There were treaty meetings, which some chiefs did not attend. The negotiators were impatient and decided to cut them out. Copies of the treaty reached other areas, but the chiefs refused to sign it. The chiefs valued their independence and were not prepared to work for the Queen. Europeans - The Europeans wanted the Treaty because they wanted all their Land (Oil, Weapons, Tech and power, fame and righteousness). How was New Zealand found? Actually James Cook, found the mysterious New Zealand. He was assassinated, there are many conclusions onto what his death lead to but many about cannibalism. (In the Hawaiian Islands). You may be wondering what this blog is about? Well this is some words to describe myself. In Room 7 we are doing art - work, we have to pick multiple objects to describe ourselves. Comment what you what word you would use to describe me. I walked into Glenbrae School filled with eager to see friends, teachers and teacher aides. I shuffled myself up the hill slowly while watching closely for friends. The weight of my bag was making me slow down, but I had finally saw my best friend, Maara. I was super cheerful, which made us have a little sit down and talk about our adventures during the holidays. The bright morning, sunshine breeze was amazing. First, Maara and I waited patiently and loudly waited for more of our friends to turn up. Soon - after, all our delightful friends came to school. We decided to catch up a little - which fortunately took us at least 30 minutes. We all walked to our classes, I was interrupted by Mr Nath (My Last Years Teacher), and told all the previous of Room 8 students to all line up and prepare for the New year and new classes. All students walked down to the hall and sat down quietly. I was nervous about which class I would be selected into, but then I realised, I’m a Year 8 student and all year 8’s are in the same class - that took away my nerves. I heard all the other students names being called into classes. Finally, my name was called, I am in Room 7 with Mrs Tofa. Mrs Tofa escorted all her students to Room 7, where there we placed our bags on hooks and sat down on comfy chairs. Mrs Tofa called out the attendance, where students said “Good Morning, Mrs Tofa”. Long after the attendance, each student received a name tag and Mrs Tofa gave us instructions “Turn your card around place it on this table”. We had to each pick a name from the ‘name table’, until we finally realised we only have 17 students. Well, when that didn’t work out I suggested that “We line up and only a few pick a name, and which ever name they get will be the partner”. Technically it did work out until we all were over excited so Mrs Tofa decided she will pick for us. Until every thing about the name tags was finished, we asked our partners some interesting questions about out 6 - 7 week School Holiday. We had learned all about each other's holidays so it was time to enjoy a little bit of fitness, Volleyball. The teams were very competitive but there had to be only one winner. The courageous winners of the Room 7 Volleyball was the Boys! The girls were very good losers but was determined to win the future games to come. That was my first day back at school! Do we still need to be talking about the Treaty of Waitangi? 50% Yes, 50 % No! Yes ~ We need to keep talking about the Europeans and what clauses that they had briefly broken/ what type of problems were caused by that. No ~ It’s because, we all want to move on from everything in the past. While watching the video you will learn the very truth about Waitangi. If I was a Maori Chief, who had refused from signing the Treaty, I would have tried to convince tribes about signing the treaty, which could cause problems. If I was a Pakeha, (Maybe James Busby or William Hobson), I would only want to get it over with. While watching the clip, it give you more knowledge about Waitangi and everything. You will also see the changes in population. I am very weird (in a good way). This, is 10 questions/facts about myself. Enjoy.